With decades of industry experience in professional hair care, ENJOY understands all aspects of hairdressing. Sulfate-Free Shampoos give the hair strength, smoothness, shine, frizz control and volume with incredible manageability. Gently eliminated build-up without stripping color with Cleanse Sensor technology. Color Safe for all hair types! Conditioners create smoothness, softness and shine. Eliminate frizz and detangle. Color Safe for all hair types. 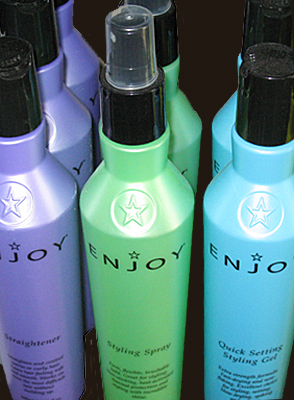 Styling aids and finishing tools are an excellent choice for styling, setting, blow drying, spiking or adding volume.